Is it worthwhile growing potatoes? Last year we made a definite loss on growing potatoes and when I met James Wong earlier this year he said growing potatoes is ‘probably the most expensive way to physically get hold of one’. Well either we haven’t learned our lesson, or we are just choosing to ignore it as we grew potatoes again this year. In our defence we already had the potato sacks and compost going spare. Last year wasn’t a very good year for potatoes and we thought that this year might be better. Plus all we needed to do was buy a few seed potatoes and ignoring the losses we made last year surely we had to be in profit this year? 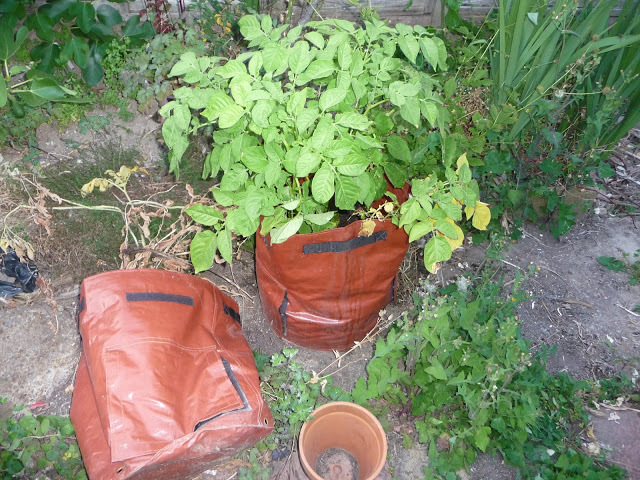 We knew one of our bags of potatoes was ready when the leaves and stems had wilted as pictured in this very interesting article I should have taken a better picture of the wilted foliage, but in the excitement I forgot to take one before we emptied the bag on the left. 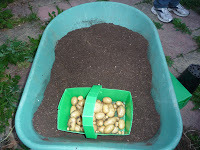 We poured the contents into our wheelbarrow and had great fun searching around in the soil for the potatoes. 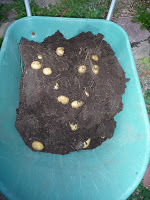 My hubby saved the soil from the potatoes to reuse on something else bearing in mind the advice in this article about reusing potato soil. When we first started growing potatoes we ambitiously thought we would need to dry them and store them which was definitely not the case last year. This year we did do better, but although we got a good number of potatoes from this bag we only had enough for one meal for my family of four plus student! 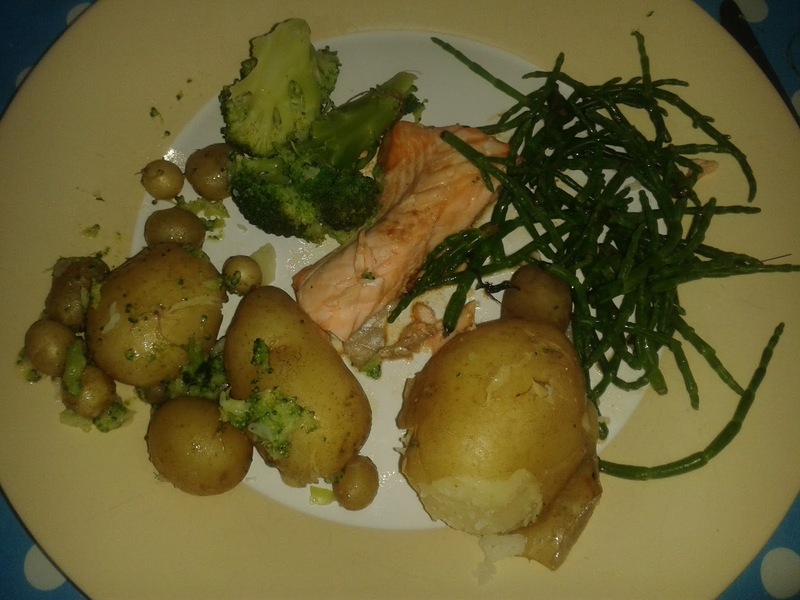 It was a pretty nice meal though – salmon, samphire, broccoli and boiled homegrown new potatoes (the picture doesn’t do it justice). We are only growing a couple of bags of potatoes this year, so will probably have another meal or two of potatoes if we are lucky! The ‘profit’ we made this year was minimal, so from a financial perspective it probably wasn’t worth it. 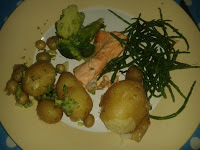 However from the perspective of being able to eat fresh homegrown potatoes from our garden it definitely was. Plus we are learning about how to grow potatoes and the kinds of yields we can get, so maybe next year we will find some more containers to grow them in and see if we can grow enough to store. So does anyone have any advice or tips for me on growing potatoes in containers? What can we do to improve our yield next year? Also it would be great if we could become self-sufficient with potatoes and not have to go out and buy seed potatoes each year – does anyone know how we could do that? This entry was tagged eco, Frugal, Gardening, Green, grow your own, homegrown, thrifty. Bookmark the permalink. I'm sorry to hear that growing potatoes has not gone well for you. I have not grown them myself before as I do not have my own garden but I have been lucky enough to recieve gifts from my friends huge bounty's of potatoes. Even if I did have a garden- maybe I will stick with buying bags from the local farm. You are lucky! I have friends with apple trees and at the right time of year I get given lots of apples – not made any friends with excess potatoes though 🙂 Buying bags of potatoes from a local farm does sound like a good alternative if you don't have the space to grow your own – thanks for the tip! I had a dire harvest the one year I grew new potatoes in pots. I think I put too many in and didn't water enough. I was told spuds need a LOT of water. Also I've had bad years in the ground. This year my new pots are lovely and plentiful which really puzzles me. I was depressed in the cold spring so didn't chit the tubers. I just left them hanging in the bag I bought them in, in the lean-to. So they were neglected, cold, but I planted them and earthed up once. Then the heatwave lol. They are the best in years. Scientific analysis suggests luck is the answer.